It seems like each day on our bikes has brought new and unexpected challenges, and we’ve learned to never take the distance on a map as an indicator of navigability by bike. 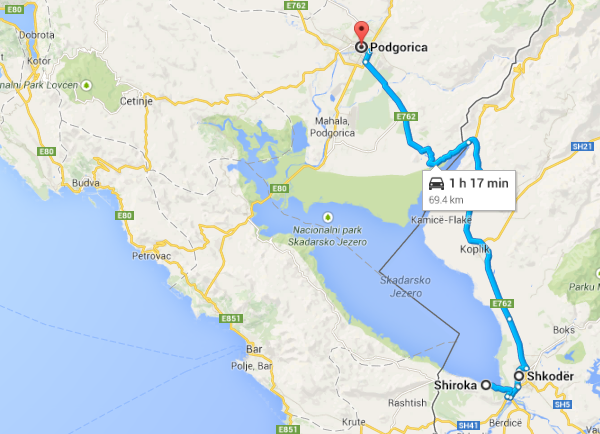 But today, for our last day on the road, we were given the gift of an easy trip to Podgorica. It almost seems like an anticlimax after putting so much sweat, blood and tears into the trip thus far, but mostly we’re just glad to be back safe with all of our appendages and most of our gear. We started the morning with a dip in Lake Shkodra in the small beach town of Shiroka, just 3 km from central Shkoder, then proceeded to retrace our steps to the same town where we’d been left by our saviors in the mountain pickup nearly a week earlier. We were surprised to find how close to the border we were, and laughed to think that we’d spent nearly 10 hours cycling up and down treacherous mountain passes only to finish our day just steps from Montenegro. Our only challenge was a strong wind that threatened to blow us clear away from Podgorica during the last 5 km, but we powered through it and into the welcoming arms of Hostel Info Podgorica, where we began our journey not long ago. It’s hard to imagine all that we’ve done, seen and learned in just two weeks in the Balkans, and we’re glad to be able to leave with such a rich collection of new experiences (and nearly 1 TB of video to prove it). Tonight I’ll enjoy a Nikšićko and some quality Ajvar, but tomorrow I’ll already be on a plane headed back to the USA. I wish I could stay longer, but if all goes as planned I’ll be back soon enough. Terrain: Scenic, enjoyable, and an easy border crossing. The trip from Shkoder to Podgorica is about 63 km, but it’s worthwhile to spend some additional time exploring the nearby towns on Lake Shkodra. The road to Podgorica is paved and mostly flat, but there are a few kilometers of very manageable hills after crossing into the Montenegrin side. The outskirts of Podgorica are flat and the road passes through several quirky neighborhoods.